Looking for a rambler home that offers a spacious floor plan and some room for customization? Then the Kennedy is just for you. The Kennedy has a total square footage of 3,105, with a floor area of 1,555 feet once finished. 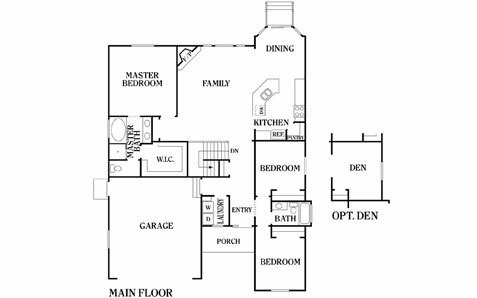 It’s built to accommodate 2 bedrooms, 1 bathroom, and a master bedroom that comes with a master bath and a walk-in closet. It also features an expansive area where the kitchen, dining area, and family area are located. What’s more, it’s built with a large garage that can accommodate up to 2 cars. If you’re interested in maximizing the Kennedy’s square footage, you may opt to include a formal home office or study in the design. You can even add a sizeable den to increase your storage space. Perry Homes Utah is your reliable heritage home builder offering high-quality homes at affordable prices. We have over 40 years of experience in constructing excellent rambler and two-story residences that suit the needs of every type of household. Our design center personnel are well-versed with the different exterior and interior options, and they can ensure that your home will stand out from the rest. Plus, we’ll advise you in choosing the appropriate upgrades so you can get the most bang for your buck. Build your perfect Utah home today by contacting Perry Homes Utah. We provide a seamless, stress-free home buying process, as well as an attentive customer service that’s ready to help you with your concerns—even at post-construction. We also offer many trustworthy financing options, so we can assist you in securing the best deal with your new home. For more information, please give us a call at 801-264-8800.